Czech composer Antonín Dvořák came to visit cousins in Spillville, Iowa and spent the summer of 1893 there, writing works ostensibly inspired by the New World but perhaps also drawn from Czech folk melodies. Find a musicologist to straighten that out. The point is he spent some time in a backwoods corner of Iowa and was glad to admit it. Native Iowan and writer of musicals Meredith Willson was born at Mason City and is also known to have visited Agincourt, where casual conversation at Adams’ Restaurant may have inspired some of the characters in “Music Man,” his most famous musical—Amity Burroughs Flynn, for example, wife/widow of half-term Agincourt mayor Edmund FitzGerald Flynn, became the model for his character Eulalie Mackenchnie Shinn. And many other artistic and political personages have passed through the community for one reason or another or none at all. Eduard Reményi (1830–1898), world-renowned violinist, appeared during the opening season of The Auditorium in 1895 (though, perhaps, a bit long in the tooth at that time and well past his expiration date). Of late, I have become consumed by the work of British artist Stanley Spencer [1891-1959] and wonder what circumstances could have acquainted him with our community and even brought him here. 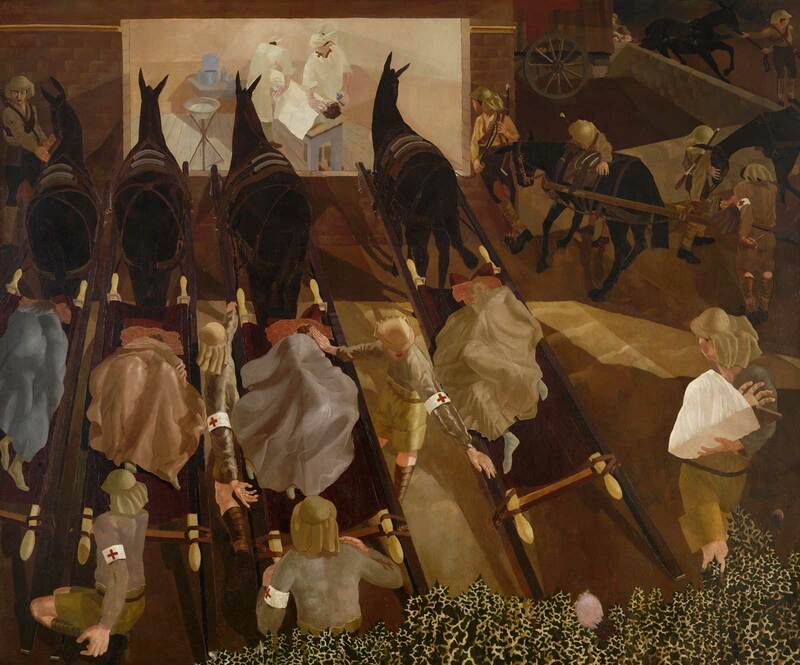 His painting below—”Travoys Arriving with Wounded” of 1919—was painted from his experience in the Royal Army Medical Corps during the Macedonia campaign of 1918, an experience that marked both Spencer and his art indelibly. Indeed it was the “Great War” theme that drew me to him in the first place and readings from Spencer’s journals and notebooks have strengthened my interests in him. War has become a topic of conversation in the LA studio lately: one student is working on The Square (whose testosterone-laden turf has intimidated me for the duration of this project) and he and I spoke at length this morning about war and why I fail so miserably at its memorialization. That, of course, reminded me of Stanley Spencer and the intimacy of his depiction which resonates so intensely with me. So I wonder now (this afternoon, with the recollection of the morning conversation so fresh) how Spencer might have been known in the town of my creation. And whether his work would have resonated with its contemporaries as powerfully as it does with me today. By agincourtiowa in Uncategorized on Wednesday/28/January/2015 .